LILJANA Simonovska wants nothing more than to hear her son Filip speak. In recent years, her five-year-old boy has blurted out odd words here and there, but none of them have ever really made sense. Filip was diagnosed with autism, a development disorder characterised by impaired social interaction and communication skills, just before his third birthday. His parents were told that the sooner they could take him to a speech therapist, the better his chances of learning to talk. 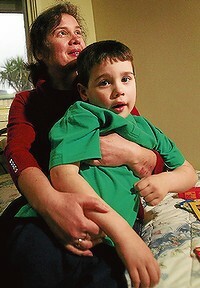 But for Mrs Simonovska, finding the right help for Filip has been a constant battle. All of the speech therapists she contacted had waiting lists of up to two years, and to pay for private sessions was impossibly expensive. Her sense of frustration was temporarily relieved by last year's Federal Government announcement that it would give parents $12,000 to spend on speech therapy for children under the age of six as part of its ''Helping Children with Autism Package''. At the time, the Government's media release boasted that parents would be able to choose early intervention measures that best suited their children, and that the $190 million package would provide greater access for those in need. But after qualifying for the program in June and contacting 32 listed providers, Mrs Simonovska has been given nothing but more huge waiting lists. ''It has made me feel so powerless. Filip's desperately trying to talk. He makes lots of sounds, especially when he is angry. I have all this money on paper to help him, but we can't do anything with it,'' she said. Mrs Simonovska and her son are not alone. Autism Victoria chief executive Murray Dawson-Smith said many Victorian families had contacted him with similar complaints. ''The Government did this with the best of intentions, but … there have been significant shortfalls in terms of families getting the support they are after,'' he said. Chris Saunders, the father of an autistic boy and member of support group ''Autism Angels'', said he knew 25 families who had not been able to use their money. He said the group had written to Bill Shorten, parliamentary secretary for disabilities and children's services, eight times requesting a meeting, without success. ''We want to work out ways for these families to access care for their severely disabled children,'' he said. Mr Saunders said a group psychology session set up by Autism Angels for parents who could not access help last year had grown from 10 children attending on a Sunday morning to 30 this month because of the growing demand for care. Mr Shorten told The Age last night that he was aware of families' problems and planned to allow more therapists to come on to the approved list of providers in October. He also plans to increase the age limit from six to seven. For Mrs Simonovska, these changes are not enough. comments from The Age here and here. Coping with Autism Spectrum Disorder Meltdowns and Behaviours. How should we teach autistic kids?